In this guitar lesson we are going to be learning about how the Dorian scale is made, what notes give it its unique sound, and one of the more common Dorian guitar scale shapes. We have supplied you with the scale diagram for the shape that we will be using in this lesson. Let’s start out with an E major scale and then alter a few of the notes in the scale to make it into a Dorian scale. The E major scale is spelled 1E 2F# 3G# 4A 5B 6C# 7D#. All that you have to do to make a major scale into a Dorian scale is lower the 3rd and 7th scale degree one half step each. G# is the 3rd scale degree in the E major scale and D# is the 7th. Lower the G# to a G and the D# to a D. That would give you an E Dorian scale, spelled 1E 2F# 3G 4A 5B 6C# 7D. Check out the scale diagram to learn the shape we are using in this lesson. 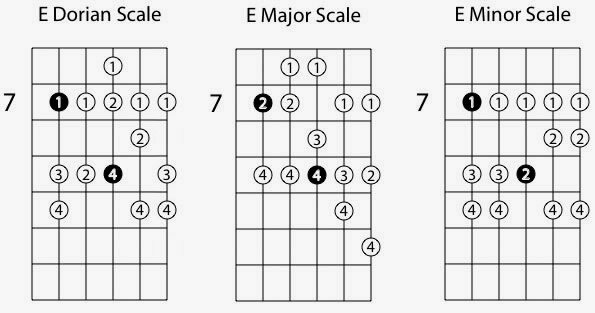 You can also think about the Dorian scale by picking any major scale and starting on the 2nd scale degree. For example, pick a D major scale. The key signature for D major is two sharps. Move to the second scale degree, an E, and start playing the scale there. You would be playing an E Dorian scale. You can also create an E Dorian scale by starting with an E minor scale, spelled 1E 2F# 3G 4A 5B 6C 7D, and raising the 6th scale degree one half step. Again this would give you 1E 2F# #G 4A 5B 6C# 7D. This raised 6th scale degree really sets apart the Dorian sound from the natural minor, or Aeolian, sound. Either way you choose to think about it is fine, they all end in the same result. Dorian scales are a minor scales so they will be a bit darker sounding than a major scale. The notes that give the Dorian scale its unique sound are the 1st, 3rd 6th, and 7th scale degrees. The 1st degree gives us our tonal center, the 3rd degree give the minor quality to the E minor chord that we will be playing over, the raised 6th scale degree gives us our unique Dorian sound, and the 7th emphasizes the other note that has been altered from the E major scale. 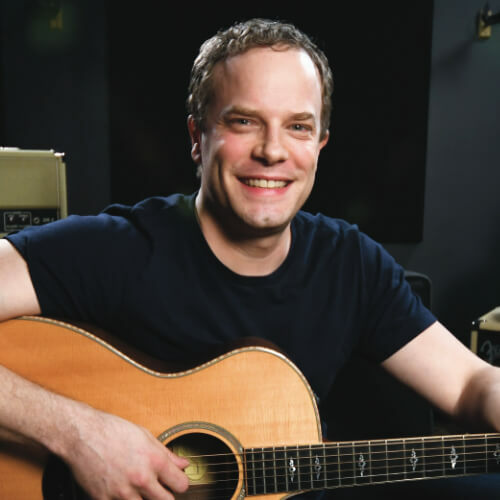 Record an E minor chord or get a friend to play it for you. Practice this E Dorian scale shape over the E minor chord. Listen to what each scale degree sounds like over the chord. If you don’t have a recorder or an available friend, just hit your low E string and let it ring out while improvising with the E Dorian scale. If you like the Dorian sound, try learning some other Dorian scale shapes and experiment with them all over the fretboard. Check out the classic jazz song “So What” to get a better idea of what improvising in the Dorian mode sounds like. You can also download the Free Jam Track By Clicking Here. This one is in A Dorian and it has a kind of Latin feel to it.